Last year, while visiting my parents, I noticed that they had a few salvaged porch posts in their barn. I immediately had a vision for one of them, but it took me a while to act on it. I pictured it with iron shelf brackets added to the bottom, so that it would stand upright and iron hooks added to the top to create a coat rack. I also pictured the coat rack being painted white. The vintage market that we did earlier this month had a shabby white, turquoise and pink theme to it and this coat rack that I had been thinking about for quite some time was going to fit our theme perfectly! 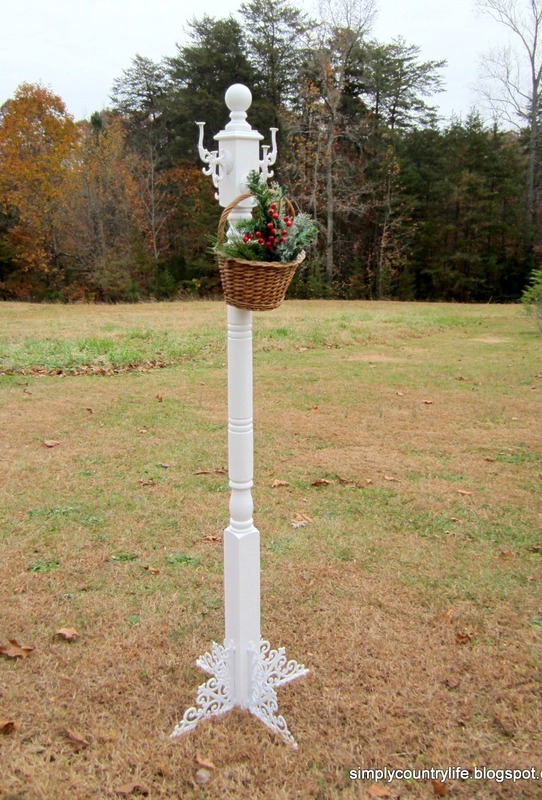 I started off with the salvaged porch post. A portion of the bottom had to be cut off to make the post 6' tall. The portion that was cut off was the part that was attached to the porch and it had a lot of old nails in it. The post also needed a good cleaning. It was quite dirty. to give it a more finished look. I primed and painted all of the pieces, including the post, before putting it together. Then my husband helped me screw a bracket to each side of the post, while I held the post up straight. Then we screwed the finial piece onto the top of the post and screwed the hooks to each side of the post. I placed the hooks at two different heights because I thought it looked better than at the same height. Two of the hooks are higher and two of the hooks are lower. Lastly, I painted the entire piece with two coats of white paint. This is an awesome piece...great idea! Love the basket hanging on it too!! This is great, Adina!! Would be cute to hang stockings on at Christmas. I love how you repurposed that post into a coat rack. Wonderfully creative and so pretty! Thank you very much Diane!